Start off your visit on the 1st (Wed): look and learn at Sarkanniemi Theme Park. Here are some ideas for day two: tour the pleasant surroundings at Pyynikki Park and Observation Tower, identify plant and animal life at Hatanpaa Arboretum, then test your problem-solving skills at popular escape rooms, and finally contemplate in the serene atmosphere at Tampere Cathedral. To find maps, more things to do, other places to visit, and more tourist information, read our Tampere trip planner . Newark, USA to Tampere is an approximately 19.5-hour flight. The time zone changes from Eastern Standard Time to Eastern European Time, which is usually a 7 hour difference. In May, Tampere is slightly colder than Newark - with highs of 59°F and lows of 39°F. Finish up your sightseeing early on the 2nd (Thu) so you can go by car to Kouvola. Kouvola is a town and municipality in southeastern Finland. 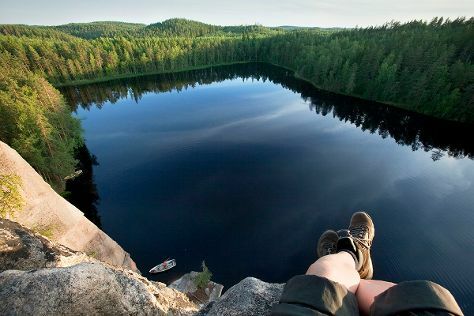 On the 3rd (Fri), explore the striking landscape of Repovesi National Park. To find ratings, traveler tips, reviews, and other tourist information, refer to the Kouvola vacation planning app . You can drive from Tampere to Kouvola in 3 hours. Other options are to do a combination of bus and train; or take a train. In May in Kouvola, expect temperatures between 60°F during the day and 42°F at night. Wrap up your sightseeing by early afternoon on the 4th (Sat) to allow time for travel back home.